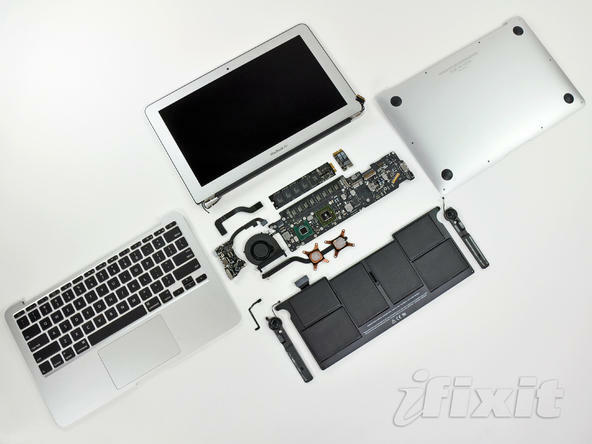 A recent teardown of the new MacBook Air today revealed that the pretty little notebook is unsurprisingly laden with a bevy of proprietary engineering making it one of the most difficult notebooks on the market to repair. Highlights of the full break down can be read after the jump. The new MacBook Air is an exercise of proprietary engineering. While you can easily access everything once you remove the proprietary screws, you can’t really replace any component with an off-the-shelf part, unless you source it from Apple or someone involved in Apple-based repair (*cough*). Most components — RAM included — are soldered to the logic board, preventing them from being replaced. We definitely recommend users to buy the 4GB RAM version of the Air, as the paltry 2GB already borders on obsolete by today’s standards. The one standout in this proprietary sea is the 64 GB SSD. It’s not locked down like the rest of the components, although it is a very slim and unusual form factor (for a hard drive). It’s attached to the logic board with what appears to be a new mini-SATA (mSATA) connector, which brings hope to super-slim-laptop-hackers all across the globe. This may enable some crafty tinkerers to rig a larger drive inside the Air, provided they can fit everything within the tight confines of the .68″ thick case. We gave 11″ MacBook Air a not-so-good repairability score of 4 out of 10, with 10 being easiest to repair. Simply put, a plethora of proprietary parts prevents people from painlessly fixing their machines. * The flip-open port door has been scrapped and the IR sensor and sleep LED are gone. In exchange, the new model manages to fit an extra USB 2.0 port along its right edge. * Apple apparently doesn’t want you inside this thing. They decided to use proprietary 5-point security Torx screws to attach the lower case. Once inside, the Air is held together with more normal 6-point T5 and T8 Torx screws. * The battery is comprised of six individual lithium-polymer cells, which combine to form a 35 Watt-hour battery. * Although in a different form factor, the new MacBook Air uses the same Broadcom BCM943224 Wi-Fi/Bluetooth chip as the current lineup of MacBook Pros. * The back of the trackpad has a Broadcom BCM5976A0K chip on it, likely responsible for the multi-touch capabilities of the trackpad. * The 11.6″ MacBook Air features a resolution of 1366×768. That’s a few more pixels and noticeably more widescreen (16×9 vs 16×10) than the 1280×800 resolution of previous Air models. In a welcome improvement, Apple has substantially enhanced the rigidity of the display assembly. The new MacBook Air is a tidy little package, but we wish Apple would stop intentionally preventing users from upgrading and repairing their devices.